The PMG-DUO 48" Video Slider with Carrying Case from ProMediaGear combines both straight and curved tracks into a single slider body. This dual-action design lets you add traditional slider moves, or dynamic parabolic moves simply by flipping the slider. If you want to use the curved side, mount the straight side on your tripod or stand, and the curved side will be on top. Likewise, mount the curved side on your tripod/stand, and the straight side will be on top. If you want to place the slider on the ground or other surface, the built-in legs on the ends adjust to support either side, curved or straight. Moreover, each leg is independently adjustable for leveling the slider on uneven terrain, and both fold for compact storage inside the included carrying case. The PMG-DUO offers multiple mounting options. There's a 3/8"-16 threaded hole at the center of both the curved and straight sides, and there are also multiple 1/4"-20 threads across both sides. Additionally, 5/8" baby pin support is provided on both ends of the slider, in either curved or straight mode for mounting on stands. For increased strength and durability, the tracks are CNC machined from a solid block of aircraft grade aluminum. The carriage clamps onto either the straight or curved sides of the track and features three aluminum wheels with precision roller bearings inside each wheel for low resistance and smooth sliding motion. A large knob releases the carriage from the track, for attachment to the other side, while a smaller knob locks it into place. Stand Receiver 2 x 5/8"
Box Dimensions (LxWxH) 53.0 x 8.0 x 4.0"
PMG-DUO 48" Video Slider with Carrying Case is rated 4.9 out of 5 by 7. Rated 5 out of 5 by Boonie from A Must Have I have owned many sliders over the past 3-4 years but this one has them all beat. 2 sliders in one - a straight and a curved slider for all different kinds of applications. I also purchased the motor assembly to go with this and it too is solid. We use the curved side with the motor for interviews and it adds such a wonderful dynamic to an interview that possibly could have been pretty boring. Rated 5 out of 5 by Anonymous from Very High Quality! Every piece of this slider is engineered to a reliable and effective design. The CNC machined aluminum is made to last! The knobs for the legs are a comfortable rubber that is easy to grip and adjust. There are bubble levels on each side of the slider to make sure you've got it balanced and there is even a pair on the carriage, so you'll easily know that it's properly mounted. Everything about this slider says quality! Operation is slick and smooth! 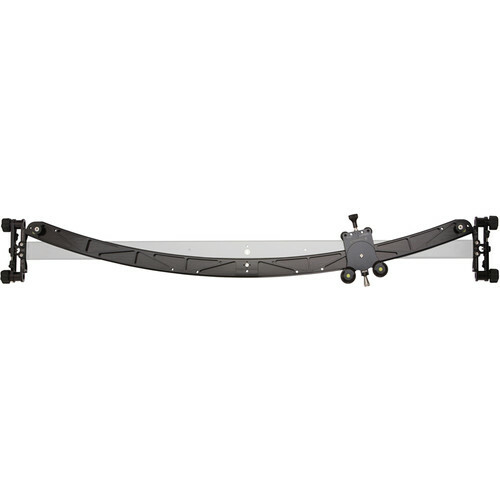 The build quality and versatility of having a bonus curved track on this slider make it an all-around winner! One thing to note; consider the radius of the curved track when deciding which size you want for this slider. The 48 slider has a 60-inch radius, meaning that the curved track will revolve on whatever is 60-inches from the track. This heavily effects my choice in focal length so that I can frame my subject as I wish and keep the revolving effect. If you are working with small objects, limited to a small space, or want to frame your subjects with a wide-angle lens, then consider the 24 version or perhaps somewhere in-between. You'll lose track length on the straight side, but it's really a matter of the scale that you're working with. Rated 5 out of 5 by Joe Mero from longer than i expected! this is very rock solid slider, it support my heavy camera without problems. Rated 5 out of 5 by Anonymous from Amazing! This slide is great for unique angles The curved feature of this slide helps you capture very unique shots. It seems to be well build and can be leveled in a matter of seconds. It slides well and has adjustable tension on the rail. Rated 5 out of 5 by Nicholas from Beautiful! Really is as good as it looks! Very, very well built! Super pleased with the results. No mention whatsoever of weight capacity? How much does this reliably support? I have a Sony FS5 Video camera. Is it necessary to mount it on a head first, or can I mount it directly on the platform (I have never used a slider before)?